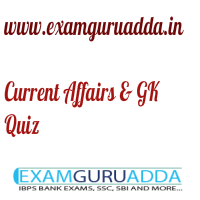 Dear Readers Examguruadda.in presents Current Affairs quiz of 29-30 November 2016 that cover important current affair events. Current Affairs quiz prepared according to the latest Bank, SSC and other competitive exam. 1. Which Indian short film has won the award at the 2016 UNESCO Salon Youth Video Competition? 2. Which country’s Davis team has won the 2016 Davis Cup tennis tournament? 3. Who has been appointed as the Director-General of Military Operations (DGMO)? 4. Which Indian snooker has won bronze at IBSF World Snooker Championship 2016? 5. India’s first and Asia’s longest cycle highway has been opened in which state of India? 6. The 2016 World Ayurveda Congress will be hosted by which country? 7. Who has been appointed as the new Delhi chief secretary? 8. Who has won the 2016 Formula 1 Abu Dhabi Grand Prix? 9. Who will head the newly constituted committee of chief ministers on demonetisation? 10. Which advisory committee has been formed by the Insolvency and Bankruptcy Board of India (IBBI) on service providers? 11. The 50th anniversary of the United Nations Commission on International Trade Law (UNCITRAL) has been hosted by which country?